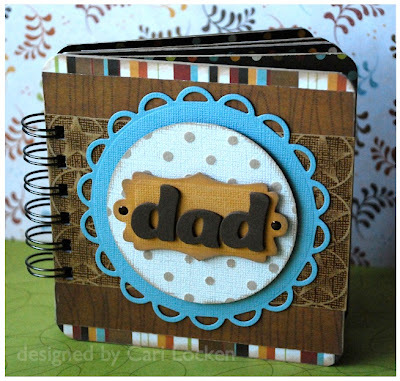 Today on the Imaginisce blog some of the Design Team members are sharing some projects that they've made for Father's day using Imaginisce products and Spellbinders dies. I decided this year to get my kiddos involved a bit in this project. 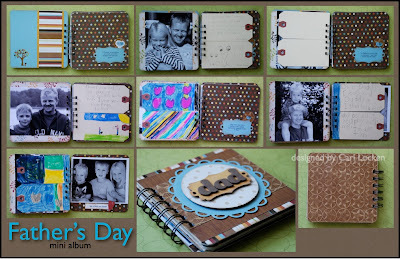 I created a mini album from scratch using 5"x 5" pieces of chipboard. I covered them with patterned papers from Apple Cider collection (last year's fall collection). On the front of the album I used a Spellbinders Nestabilities die (blue cardstock) along with a Spellbinders Shapeabilities die (label in yellow cardstock) for the title part. I had my children write a little something on 2 tags. My boys were getting creative and enjoying this and colored some pictures on the back of their tags. I included these tags beside their pictures and bound it all together with my Bind-it-all machine. this is just delightful, I love the blue and brown together! This turned out so wonderful! I'm sure Dad will be thrilled to get it! I love how you integrated all the handmade items in the album. what an amazing idea!!! thanks so much for sharing!!!! your work is really beautiful Cari, you have inspired me so many times - thanks a million!!! Wow this is fantasic Love it :) I am your newest Stalker from Australia HI ! !